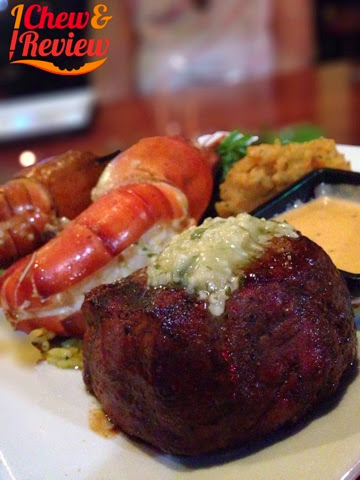 I have to admit, there are very few restaurants in my regular rotation in The Woodlands. I try to eat local when I can, so that eliminates a good portion of the establishments in The Wood. 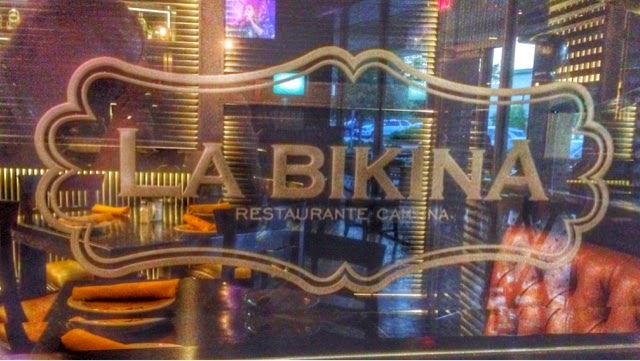 One of the locally owned places I've been wanting to try is La Bikina, so when some friends and I were invited to a tasting there, I immediately accepted. The decor there is stunningly beautiful but very comfortable at the same time. Some of the lyrics to the song La Bikina, the restaurant's namesake, are on the wall in block letters creating an eye-catching art piece. I love the fact he has purse stands available so you don't have to hang your purse on your knee or put it on the floor. It's a nice touch. And that's another thing I noticed about La Bikina--the small customer-focused touches such as tables with special cup holders so the entire surface can be used to enjoy a game of dominos to free cab rides home within The Woodlands if you indulge a little too much. Okay, moving on to the food. 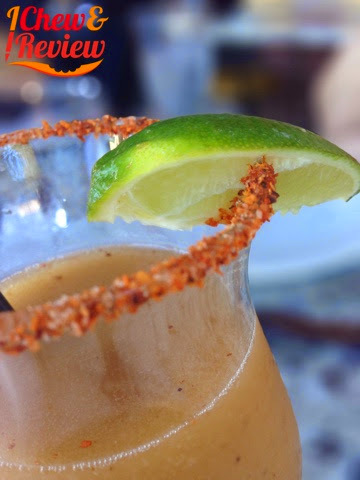 We started off with chips and salsa along with some cocktails including a tamarind margarita (that's what I had and is pictured), mango margarita, and a Cosmo. 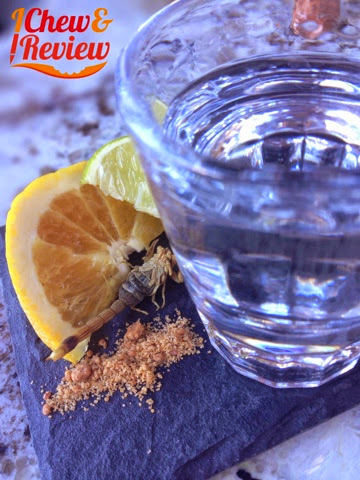 I also had to try the tequila shot with the scorpion and worm salt. The scorpion had a slightly nutty flavor, but was a little crunchy for my taste. The tequila washed it down nicely though! 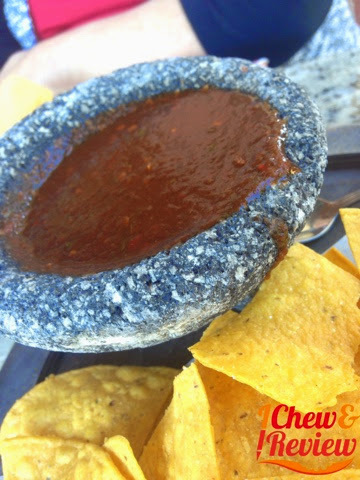 We were served the molcajete de queso shortly after I found a scorpion toe in my tooth (not really). 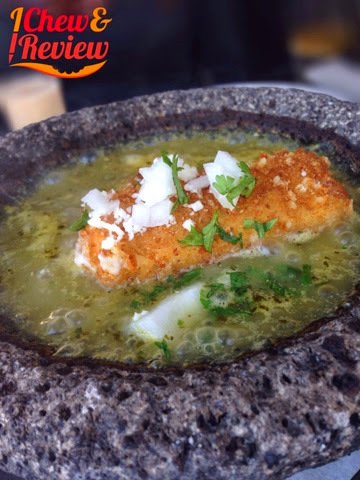 Mozzarella cheese is breaded in chicharrones and placed in a molcajete containing tomatillo sauce. We sliced the cheese, stirred it, and spread it on corn tortillas. I added a little habanero sauce to up the heat a little. This stuff was delicious and is a really big portion for $12.50. The star of the show for me was the snapper. I was somewhat intimidated by the photos I'd seen, but it's surprisingly easy to eat. 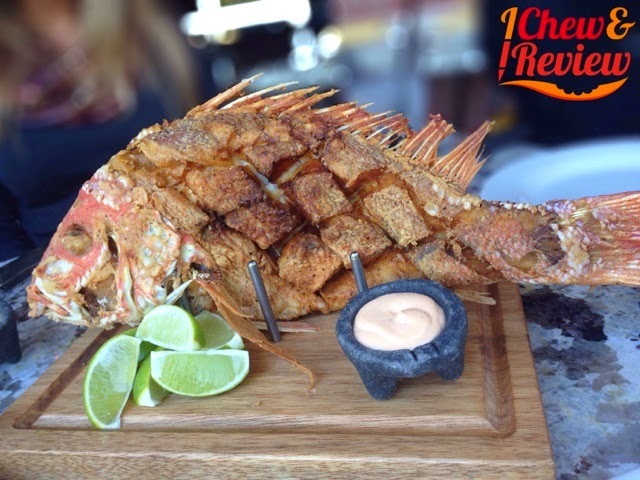 The fish is scored so you can just pluck a cube of the flaky mild fish right which has been brushed with white whine and lemon right off its little body. It can easily feed two, so at $27, I think it's a good value. 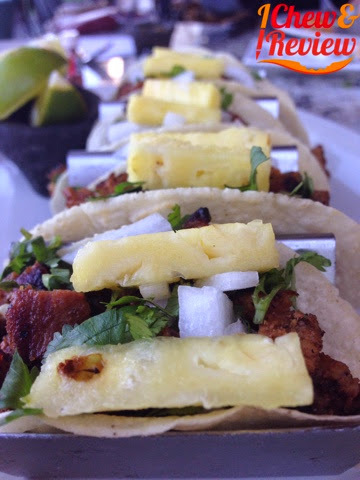 We also sampled the pastor tacos, and while good, I think I prefer the pastor from the taco truck by my house. It's probably because it's what I'm used to. 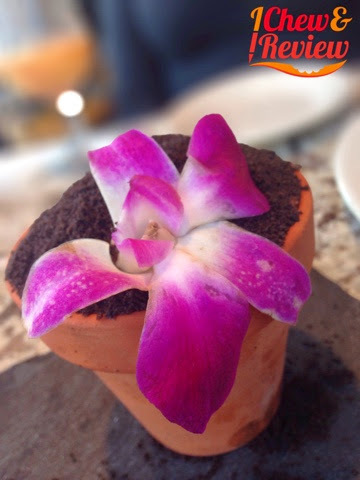 For dessert we sampled the churros and a chocolate mousse served in a clay pot. I'm not a fan of fried dough, so they churros weren't my favorite, but they were loved by my dining companions. 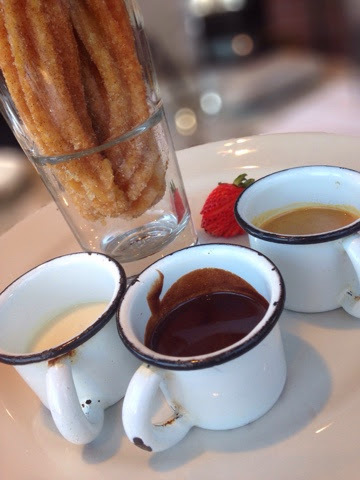 The churros come with 3 dipping sauces: chocolate, vanilla, and dulce de leche. 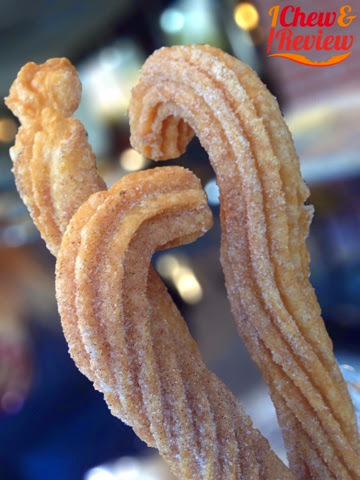 The presentation is beautiful, with the churros standing over 12" high in a glass. The mousse was absolutely delicious. It's wasn't overly sweet, and the crushed chocolate cookies added a nice textural element. 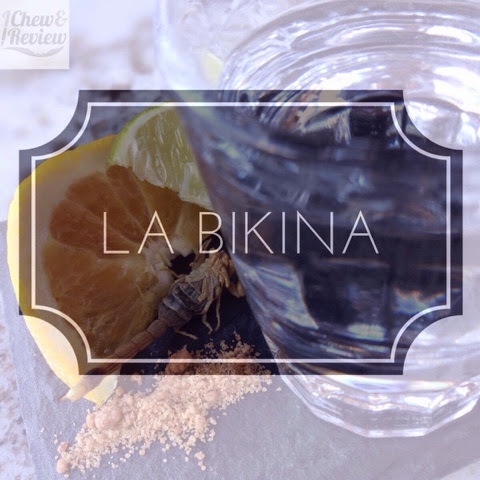 From reading some initial reviews, it seems La Bikina got off to a slightly rough start. I think they are beginning to hit their stride, and we were all impressed. I can't wait to go back for a happy hour (most items on that menu are $6) or for a night cap and a taco since he's open until 2 on Thursdays, Fridays and Saturdays. I'm usually hesitant to write a review after only one visit, but since I don't get out to The Vintage area very often, I decided pen a review after my first experience at Peli Peli. I struggle to find a steak up in this area that just knocks it out of the park. Aside from one misstep, last night's steak as well as the entire meal at Peli Peli was a home run. Being South African fusion, I was a bit curious what this was going to be like. The decor and atmosphere of Peli Peli reminds me of something you'd see in Vegas with the color changing LED lights. 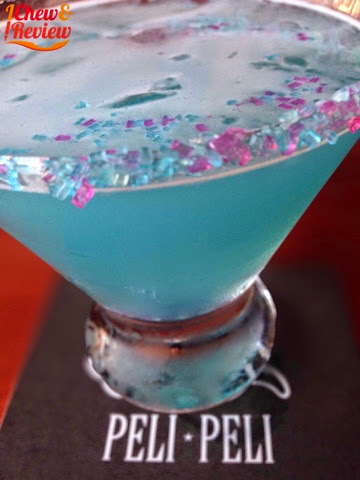 We started off with this lovely little blueberry twist cocktail that was the perfect combination of sweet and tart and wasn't overly fruity. 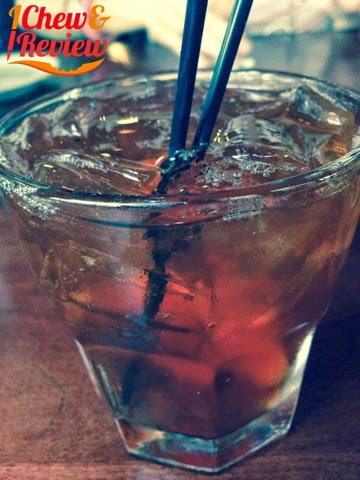 I followed that with a South African Gentleman, Peli's twist on an Old Fashioned. It actually had espresso vodka in it which was surprisingly a nice addition. It almost gave the drink some chocolate noted and enhanced the caramel in the bourbon. The bobotie was a recommended appetizer, so we opted for that. 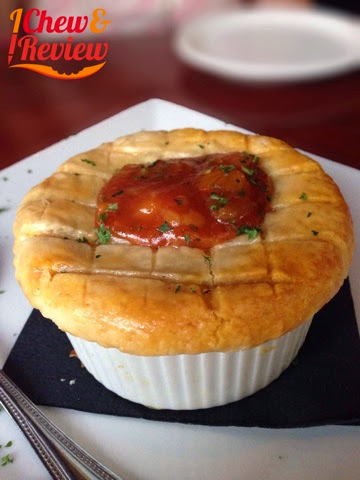 It is their version of an English Cottage Pie topped with a flaky crust and mango chutney. The flavor profile was different from anything I've tasted before and was sweet and savory. Our server, who was excellent by the way, emphasized the importance of eating all the layers together, and I agree with her. The layers, including mango chutney, puff pastry, carrot bredie, and curried ground beef, played a critical role in the overall texture and flavor of the dish. 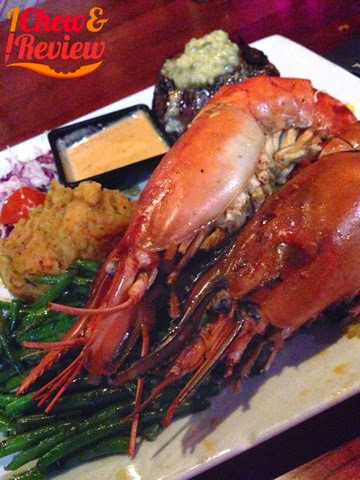 It was difficult to decide what to order, but I ended up choosing the surf and turf which included an 8oz filet and 2 prawns. I had been told the prawns were large, but these suckers were huge! Our server peeled them table side for us as she explained how to eat them and for us not to miss the meat up near the prawn's head. This was the most disappointing part of the meal because that meat was complete mush. Both my dining companion and I thought they were a little overcooked. However, the tails were still very flavorful even though they were a bit tough. The steak was cooked a perfect medium rare with a nice char and I could almost cut it with a fork. Like butter. I have to say, it's one of the better steaks I've had in quite some time. I chose carrot bredie and green beans as my sides. The bredie is basically a carrot couscous and was a little bit sweet and different than any cous cous I've ever had. 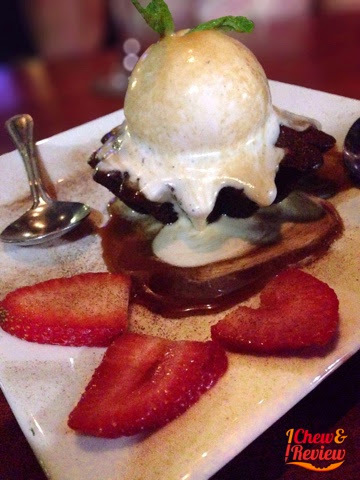 Before I went, I had already decided to get the sticky toffee pudding for dessert. I make this every year around Christmas, and this version didn't disappoint. It was a little "cakier" than the one I make and mine is a bit more "sticky," but it was not overly sweet and was a great way to end our meal. For more information on Peli Peli, visit their website, pelipeli.com.